June 1, 2014, 4:05 PM · A nightmare for any theme park goer who is non-ambulatory is to get stuck on a ride. Sometimes the ride starts again after a few minutes of waiting, but sometimes guests have to be evacuated. One can end up surrounded by water or in very narrow spaces where the wheelchair cannot fit. I have never gotten stuck in a ride since I was left in a wheelchair until I rode Disneyland's Indiana Jones two years ago. Indy’s vehicle stopped just a few feet from the unloading area, but the walkway at that point is too narrow for my wheelchair to be placed next to the vehicle. Cast members unloaded the other guests in my vehicle, and one of them told me that I had to wait. I was not freaked out for three reasons. First, the ride was so jumpy that I needed to catch my breath, so the waiting served as recovery. Second, the cast member stayed with me all the time. He also talked to me while I waited, and that conversation took away any anxiety. Third, I could see the unloading area from my vehicle, and psychologically speaking, it helps. I waited like 15 minutes, and the vehicle moved again. It could have been worse, much worse. I remember reading that Forbidden Journey got stuck, and they had to call firefighters to bring people down from their seats. In my case, that would have been a nightmare. Have you ever been on a ride that had to stop before reaching unload, from which you could not be evacuated within a few minutes? What happened, and how did the park employees respond? Please tell us your story, in the comments. June 1, 2014 at 4:09 PM · The forbidden Journey ride broke down on three different occasions when I was last there. We didn't have to evacuate but we broke down lent back which was a bit awkward for the mind and sort of hurt the neck. In the end we all got queue jump passes for the day. June 1, 2014 at 4:37 PM · I was at cedar point once and the millennium force didn't connect to the pull cable correctly. So the first 3 cars pulled out of the station onto the hill and suddenly jolted to a hault and stayed there for about an hour. It was miserable because it was in the middle of the day and we were staring straight at the sun. The workers called maintence to have it fixed and kept us updated since we were not in the station. They decided it would be best to go ahead and unload the other trains. So they took us to the top of the 310 foot hill and set the parking break. They brought in the other trains and unloaded them. That was so scary because it was so high and it was windy! The coaster was swaying and it was terrifying! After about 5-10 minutes, they brought the chain up to where we were parked and finished pulling is over the hill. It was the most terrifying experience for me but we did get a re-ride immediately after. June 1, 2014 at 4:51 PM · The family and I were at Universal Studios Florida summer 1998. The clouds were looking pretty mean, so we decided to ride Back to The Future (inside ride). While on the ride the power (John Hammond's friend) went out. The IMAX theater went completely back and a siren began to do its deal. The work lights came on and the "LAB technicians" started to setup chain rails on walkways that were beside the ride vehicles. During this I was with my creative family who decided to make the car shake and yell to the other cars in the theater, HELLO FELLOW SPACE TRAVELERS. The Asian tourist did not look amused, but they took our picture.... Missing that ride now. June 1, 2014 at 4:59 PM · We got stuck on ET at Universal Orlando and my 3 year old daughter slipped and fell. She ruined her outfit and had scraps and bruises. Within moments of getting outside from the ride, we had a Universal Supervisor there taking our daughter to a store for a new outfit and medical services had her cleaned up a few minutes later. They offered express passes for the rest of the day...but we have premier passes so there was no need. June 1, 2014 at 5:09 PM · Happened numerous times, but the worst was on Forbidden Journey. Ride stopped when our car was tilted forward, so all my weight, considerable at the time, was squeezed onto my chest. We stayed that way at least 10 minutes before the lights came on and we were straightened up. However it still took 10 - 15 minutes to get us out after numerous false starts. That was the most miserable I have ever been anywhere! Strange place with the lights on, but very interesting to see. 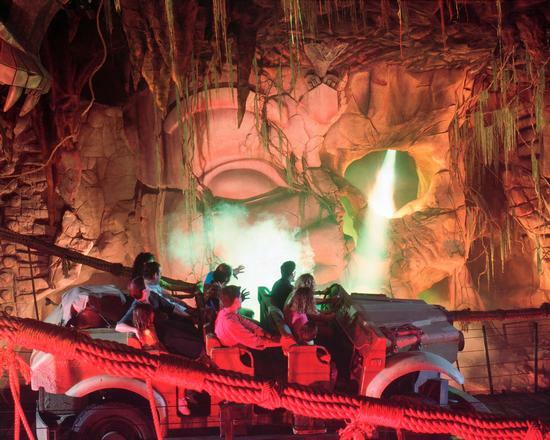 June 1, 2014 at 6:18 PM · The exciting evac was on Pirates at Disneyland. Cast members have to wade into the water and pull the boats around. And you get a nice behind the scenes tour. The boring evac was off of the Red Car Trolley at DCA. The conductor hit the emergency brake when a child ran in front of the train. They manually opened the doors and asked us all to step off before restarting the train. A mere 100 ft from it's destination. June 1, 2014 at 6:45 PM · A few years ago my husband and I got stuck inside Spaceship Earth at Epcot. We were all the way at the top and tilted backwards. Eventually we had to climb out, which wasn't easy. Them we walked down a narrow staircase to the bottom. None of the cast members said too much by way of any apology and by time we got out the park was closing. June 1, 2014 at 6:57 PM · Had FJ shut down for a minute or two as soon as we were seated, so the ride fired back up and didn't miss a beat. at the scariest part. It was very dark and it sounded like the dinosaurs were just outside the Time Rover and were going to eat us. Then, the whole ride when pitch dark, which seemed forever. She started to cry and shake. All I could do was hold and talk to her. The techs had to come down and do something to our Time Rover to start the ride up. They asked if we wanted to ride again, but my daughter was too scaried. I was a very terrifying experience. June 2, 2014 at 3:40 AM · Got stuck on Revenge of the Mummy at universal orlando. we could hear the loading area being evacuated before we knew what was going on. they finally told us that the ride was being evacuated. Unfortunately i don't really fit in the ride comfortably (i am tall and large) so sitting there waiting was painful in the end i was beginning to get anxious and very un-nerved. But i understand why it took so long to evacuate us, we weren't stuck in a troublesome area (the main coaster) or one of the flame or smoke areas so they left us until last. June 2, 2014 at 4:12 AM · During my last visit to Magic Kingdom (2010 I think) as soon as I steped of of Peter Pans flight the ride stopped. Also broke down on FJ in 2011 while leaning forward. Oh yeah. I was infront of Arragog. In 2013 while on the Simpsons in Orlando the ride didn't brake down, but room 4 (the room I was in) was shaking crazier than it should have. That also happened before I went to see the fireworks outside the building. On the same day as my Simpsons incident, just as I walked out of ET the Simpsons received a lighting strike. June 2, 2014 at 7:43 AM · Being a local I have been "lucky" enough to have been evacuated off a lot of rides. At Animal Kingdom, Dinosaur kept doing the stop and go routine, before finally shutting down with all the lights on. The funny part was seeing all the "greenery" and shrubs in the ride that looked like Disney just stapled up old Christmas tree branches. LOL. We were stuck right in front of the Dinosaur that jumps out at you for the photo op; imagine my surprise when I saw another Dinosaur mounted on the exact oposite wall that must have been turned off for along time. (too scary for kids?) The SAME night I got evacuated of Expedition Everest and we got stuck right on the lift hill that looks like a bridge. Meanwhile over at Universal we got stuck an Harry Potter/FJ. It was kind of cool since all the lights came on giving us a look at all the technology that brings this ride to life. The best was being stuck on the last hill on Hollywood Rip, Ride, Rock-it in December when it was freezing. We were so high up we could see the fireworks going on at Disney. The had to bring up a battery back that opened the hydrolic restraint systems. Fun, Fun, Fun! June 2, 2014 at 8:28 AM · I got stuck on Space Mountain at Disneyland many years ago, before the big refurbishment it got a while back. We were stuck close to the end of the ride, at the point where it spirals. The lights all came on, and let me tell you, that ride is a heck of a lot more terrifying when you see the cracks in the ceiling from the earthquakes! Now, as a resident of SoCal, you quickly learn that the cracks are supposed to be there, that's all part of the building's safety in a quake, but it still doesn't give you a lot of confidence when you see them in an indoor roller coaster! We got an immediate re-ride once it all got going again, probably 15 minutes later. June 2, 2014 at 10:11 AM · About a year ago, my wife and I went to Six Flags New England mainly to get a few rides on Bizarro, since that really is the only good ride in the entire park. Our first ride went smoothly, then we went through the park to hit other rides, since the Bizarro line was pretty long. We tried a little later to get a second ride, but the ride had a breakdown in which they emptied the queue, so we decided to come back later. At the end of the day, we went back to Bizarro and got in line. After a bit, we were finally ready, we were next, when a guy exiting the ride vomited all over the loading station. So, things close down again, but we still stay in line. After about 20 minutes or so (they ran out of the cleaner, so they needed maintenance to come with more), we finally got on. Again, the ride was awesome. But just before we get into the station, the ride stops and we hang out there for about 30 minutes. Apparently there was another incident in the loading station. It went on so long that an employee came out to talk to those of us stuck on the train. My wife and I were ok, we joked around with her, but I think some other people were upset. After the wait, Bizarro finally stopped holding us hostage and we went on our way home. Like I said, it really is the only good ride there, and we were not gonna try our luck with a third ride. June 2, 2014 at 11:05 AM · Way back in the day (I was 12) I had the worst experience ever. Stuck on Space Mountain for three hours. On the lift hill with the blaring lights that are supposed to look like you are taking off. I had those lights seared to my brain for a very long time. The only good thing is that I got to ride the entire ride with the lights on. Its not nearly as fun when you realize its basically just an indoor wild mouse/mini coaster. June 2, 2014 at 1:11 PM · I was on Mamba at WOF when the train stopped halfway up the lift hill. It was at night so it was actually kind of pleasant with a nice breeze about 100 feet above the ground. While waiting for maintenance to show up, one of the ride ops walked up the stairs to talk to us. She said it was going to be a few minutes, and then sat down on the stairs and said "So, where's everyone from?" One of the more enjoyable e-stops I've experienced. The only e-stop I've experienced where people freaked out was on the Loch Ness Monster on the 2nd lift hill. We were stopped less than 5 minutes but all the pre-teen girls on the train immediately decided "we're all gonna die!!!" June 3, 2014 at 2:17 PM · Got stuck on Rock n roller coaster at Dusneyland Paris once. Sat in the dark for about 10 mins and then there was an announcement in French that I couldn't understand (I don't speak French) - finally an announcement was made in English that explained we had to wait for the technicians to arrrive to free us. We sat for another twenty minutes or do with the lights on and then were evacuated - it was an uncomfortable experience but it was amazing to see the whole ride with the lights on!